Gran Fan Aidan Naughton sent us this newspaper article re the biography of Ian Dury. The Kilburn and the High Roads gig with Ian Dury on vocals was on Thursday 4th July 1974. 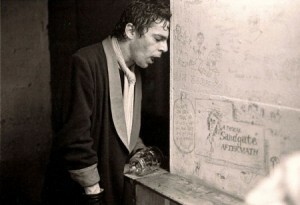 September 9, 2009 by Will Birch : This great photograph was taken by Alain Le Kim, minutes after a sweat-soaked Ian Dury came off stage at Bristol Granary Club in 1974 where he appeared with Kilburn and The High Roads. In the audience was Ian’s art college tutor and mentor Peter Blake, who spent most of the set in front of the stage, mesmerised by Ian’s performance. ‘Ian would wind people up,’ recalls Blake. ‘At one point he tried to get the other Kilburns to throw the man who ran the Granary Club off the balcony!’ Photo copyright Alain Le Kim. Posted by Al	on Apr 18th, 2010	and is filed under 8.